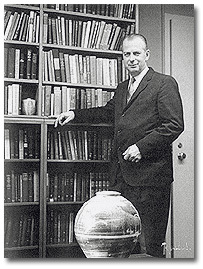 The Reverend Walter Donald Kring died suddenly on January 15, 1999 at his home in East Brookfield, Massachusetts. Active in denominational affairs, he served as secretary of the American Unitarian Association, a trustee of the Unitarian Universalist Service Committee, and president of the Board of Trustees of Beacon Press. A dedicated historian and author, Mr. Kring published Liberals Among the Orthodox: Unitarian Beginnings in New York City, 1819 – 1839 in 1974, Henry Whitney Bellows in 1979, and Herman Melville’s Religious Journey in 1997. – From the Unitarian Universalist Association, 1999-2000 Directory. Walter Donald Kring was born in Lakewood, Ohio on March 10, 1916. The family moved to California just in time to face the Great Depression and the Long Beach earthquake, the second worst earthquake in modern times. 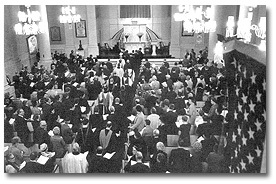 The celebration of the 150th anniversary of All Souls’ Church in 1969. Walter Donald went to Occidental College. In college, Walter was very much interested in philosophy and religion, and Occidental College offered two scholarships for juniors at the University of Hawaii and Lingnan University in Canton, China. Walter applied for and was accepted for the exchange scholarship to Hawaii. Thus, he spent his junior year at the University of Hawaii, studying Oriental religion, philosophy, and anthropology through the exchange program. The greatest event of that year was his meeting and studying with a great Quaker, Thomas R. Kelly. Walter was Kelly’s only major student, and under him, Walter studied ethics, Western philosophy, as well as Chinese, Japanese, and Indian religion and philosophy. Most of all he was impressed with Kelly’s Quaker views in religion, especially the belief in Man as a being who could go to God directly without intermediaries. When he began to think about a graduate school, much pressure was on Walter Kring to enter the Presbyterian ministry. The Presbyterian seminaries at that time appeared to be too conservative for him, so at the suggestion of Elton Trueblood—another Quaker who was the chaplain at Stanford University—who came to Occidental for a religious emphasis week, he applied to the Harvard Divinity School. 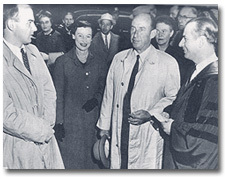 Adlai Stevenson, presidential candidate, arrives at All Souls during the 1956 presidential campaign. Left-Right, Stevenson’s son, Eleanor Clark French, Mr. Stevenson, and Dr. Kring. Walter Kring went to Harvard Divinity School in the Fall of 1937. His class consisted of only eight men. He was the first person who was under the care of the rather conservative Boston Presbytery ever to go to Harvard Divinity School. He did some field work in a Congregational church in Belmont. Then, at the beginning of his second year at the Divinity School, Williard L. Sperry, the Dean of the Divinity School and the Preacher to the University, asked Walter Kring to assist them in the daily services at the college chapel: meeting the preachers (often professors), going over the order of service with them, and listening to all of them preach. The next year, in addition to helping Dean Sperry, he became the student assistant at the First Church in Boston under Charles Edwards Park, who taught a preaching class at the Divinity School. Walter Kring graduated in the Divinity School Class of 1940. Walter’s mother was a great influence in encouraging him to return to the Presbyterian fold. He candidated for a little Presbyterian church in Hoosick Falls, New York, where he then accepted a call. The ministry at Hoosick Falls was to be a short one because that December the Japanese attacked Pearl Harbor, and America was in World War II. It wasn’t long before Walter Kring was practically the only young man left in the town. He served as cub master, scout master, and air scout master all at the same time. Although from his Quaker teachers he had strong feelings against the war, he volunteered for the Naval Chaplaincy. He went to the Chaplain’s School in Williamsburg, Virginia after bidding good-bye to his parish in Hoosick Falls. 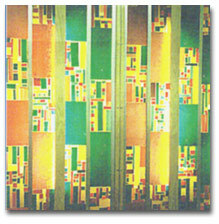 An orignal stained glass work by Dr. Kring. With the Naval Chaplaincy program, Walter preached to large congregations of approximately 1500 men. Chapel was compulsory, and he enjoyed his work with the bright young sailors. Walter asked for aircraft carrier duty for this first assignment at sea, and soon received orders in January 1945 to report to the U.S.S. “Shamrock Bay.” The ship left a week before Easter to engage in a 90 day stint in the terrible battle of Okinawa. From the ship, pilots flew direct support for the marines on the ground. The crew saw many American ships that were damaged by the kamikazes but, fortunately, the “Shamrock Bay” was never hit. 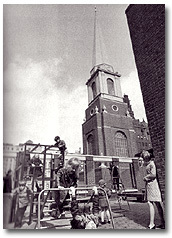 While decommissioning in South Boston, Walter Kring again made contacts with the First Church in Boston. He preached several times at the Second Church, and they wanted to extend a call to him. But the last time he preached there, he discovered—to his surprise—that there was a pulpit committee from the First Unitarian Church in Worcester, Massachusetts. They wanted him to visit Worcester. The All Souls’ School Playground on the Roof. Walter went out to Worcester and met the minister, Dr. Maxwell Savage, who had just completed 27 years as the minister of the church, building it into one of the largest in the Unitarian denomination. Maxwell Savage was the son of Minot Savage, a famous Unitarian minister, and a brother-in-law of Minot Simons, for many years the minister of All Souls, New York. In Kring’s opinion, the Worcester church was too large and important for a person with his meager experience. He never would have sought that church. To his surprise, they sought him, a thirty-year-old Presbyterian, to be their minister. He began his ministry in Worcester in September, 1946. It was a tremendous job for one so young. Kring should have had more parish experience. 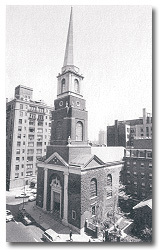 Nonetheless, he and the people got along well, and the only unhappy time that he had with the Worcester congregation was when he told them after nine years of ministry that he had been called to All Souls Church in New York City and that he expected to accept the call. Walter Donald Kring became the eighth minister of the Unitarian Church of All Souls on Sunday evening, November 20, 1955. No account of Walter Kring’s ministry would be complete without some mention of his work as a potter. Interest in this hobby began at Harvard graduate school when he took a course in “Chinese and Japanese Art” from Langdon Warner, a distinguished Orientalist. He became extremely interested in the Sung period of Chinese history, the celadon glazes (blues and greens) and the ox-blood glazes (bright red) that adorn so many ceramic pieces in museums. When he went to his first parish in Hoosick Falls, he built a primitive kiln in the back yard. After settling in Worcester after the war, Mr. Kring built a high-temperature kiln and conducted thousands of experiments to recreate such Oriental glazes. A trip to Japan in 1953 had only whetted his pleasure from these ceramics. He displayed many of his pots in American museums while minister at the Worcester church. When he was called to New York, the chairman of the search committee told Mr. Kring that he was concerned about his hobby if he lived in New York City. Walter Kring thought that the committee believed his hobby would interfere with his more important church work. Quite the opposite, the committee wanted him to continue his artistic work, but felt that it might be difficult in the city. Dr. Kring has continued with his hobby to this day, throwing many pots on the wheel and entering many exhibitions and shows. Largely due to a long summer vacation, Walter Kring was able to continue his hobby all through his ministry at All Souls. Walter Kring’s ministry was to last 23 years, the second longest minister in the history of All Souls. — Adapted from Safely Onward: The History of the Unitarian Church of All Souls, New York City, Volume 3: 1882-1978 (New York: The Unitarian Church of All Souls, 1991).